As President Barack Obama and his national security advisors continue to weigh the costs and benefits of providing greater financial and materiel support for elements of the Syrian opposition—potentially including lethal aid—it is important to understand the structure of the Syrian opposition, which remains plagued by many divisions. Supporting the foundation of a cohesive future government of Syria is one of the core objectives of the United States, as the Center for American Progress has stated in the past. The success or failure of efforts to form a more cohesive opposition will shape the ongoing effort to advance a transition in power from President Bashar al-Assad, as well as the stability of a post-Assad Syria. In order to understand the viability of U.S. policy options in Syria in both the near and long terms, a thorough understanding of the Syrian opposition—including its structure, leadership, funding sources, and internal divisions—is needed. It is important to understand that information about the various rebel groups operating in Syria is limited. Policymakers and analysts are reliant on in-country reporting by the small number of journalists and intelligence officers operating in Syria, leading to gaps in knowledge, conflicting information, and a range of estimates that varies widely on the size of the rebel groups. In addition, obtaining reliable information is complicated by the fluid situation on the ground—alliances shift, rebel groups change in size and structure, and the relations between these groups evolve. That being said, a basic outline of the Syrian opposition can be pieced together through the information available in open- source reporting. This issue brief outlines the official organization of the political and military elements of the Syrian opposition, along with the informal relationships and interactions between these groups, in an attempt to provide policymakers with a more accurate picture of the anti-Assad rebellion. Two main organizations form the national structure of the Syrian opposition. The National Coalition of Syrian Revolution and Opposition Forces, also known as the Syrian Opposition Coalition, and the Supreme Joint Military Command, or SMC, are provisional bodies, formed in November and December 2012, respectively, with significant support from the international community. These two interconnected but independent bodies aim to coordinate a cohesive, national, and democratic opposition that could fill the potential power vacuum following President Assad’s fall. There is a sizable discrepancy, however, between the structure that these bodies attempt to impose on the opposition movement, and the chaotic, disorganized nature of the various rebel groups on the ground that they represent. The Syrian Opposition Coalition and SMC are designed to impose a top-down national strategy and governing structure for the political and military arms of the Syrian opposition, using their international political, financial, and military support as leverage with in-country rebel groups. Instead, the two bodies have displayed a limited ability to manage or control the myriad of opposition groups and civilian councils in Syria. They receive bottom-up legitimacy from in-country groups, which voluntarily pledge a degree of loyalty to these two national organizations in order to receive materiel and financial support from the international community. In practice, the Syrian Opposition Coalition and SMC are the international faces of the Syrian opposition and act to secure resources for the rebellion but have so far been unable to provide the internal cohesion or strategy they were designed to create. The National Coalition of Syrian Revolution and Opposition Forces, also known as the Syrian Opposition Coalition, or SOC, has been recognized as the legitimate political representative of the Syrian people by the United States and the majority of the international community but has not yet been recognized as the legal representative of the Syrian people. It was formed in November 2012 at a conference held by Syrian opposition groups in Doha, Qatar, based on veteran dissident Riad Seif ’s Syrian National Initiative proposal. The Syrian Opposition Coalition seeks to represent and coordinate the political elements of the Syrian opposition and unite them around a provisional government that would govern Syria following the collapse of the Assad regime. It is designed to provide international donors with a legitimate, unified channel for all aid to the rebellion by acting as a moderate umbrella group representing the majority of activists, militia, and local councilmen in the Syrian opposition. The formation of the SOC would, in theory, allow the Syrian opposition and the international community to isolate and marginalize more extremist elements of the rebellion. The Syrian Opposition Coalition is made up of 71 representatives of key opposition groups, including the Syrian National Council, the Muslim Brotherhood of Syria, the Syrian Revolution General Commission, Local Coordination Committees, local revolutionary councils from across the country, individuals with long histories of opposing the regime, and a small number of Kurdish political leaders. Ghassan Hitto, a Western-educated businessman strongly backed by the Syrian National Council and the Muslim Brotherhood, was elected prime minister of the Syrian Opposition Coalition’s transitional government in March 2013. Moaz al-Khatib, a moderate Islamist opposition leader, served as president of the SOC from its formation in November 2012 until his resignation this April following a dispute over Hitto’s election as prime minister. George Sabra—a Christian teacher, former communist, and chief of the Syrian National Council—is serving as the interim president in Khatib’s absence. The Syrian National Council—an organization founded in October 2011 in an attempt to form a unified opposition framework—is one of the Syrian Opposition Coalition’s main constituents, and current and former members of the Syrian National Council make up roughly half of the SOC’s leadership. Both Hitto and the Syrian National Council have deep ties to the Muslim Brotherhood, a point of conflict within the Syrian Opposition Coalition’s leadership and among its international backers. More moderate opposition leaders such as former president Khatib have pushed for a transitional government—one that combines leadership of the opposition with members of the current Syrian government—as a means of retaining the governmental structure and avoiding chaos in the transition to an elected-civilian government. Prime Minister Hitto and members of the Syrian National Council have instead pushed for the formation of a provisional government, which would replace the current Syrian government and exclude all members of the Assad regime. International backers have supported their preferred factions within the Syrian Opposition Coalition in an attempt to shape the political direction of the organization. Qatar and Turkey, who both have close ties with the Muslim Brotherhood in Syria and share some ideological elements of their platform, supported Hitto’s election as prime minister. Saudi Arabia and the United Arab Emirates, who are deeply suspicious of the Muslim Brotherhood’s influence within the nascent political organization, have been supportive of Khatib and members of his faction within the SOC. As a political entity composed primarily of exiled Syrians—many of whom have not been in the country for months or years—the Syrian Opposition Coalition is frequently criticized by rebel groups for being out of touch with the in-country rebellion, contributing to its limited credibility on the ground. Whether or not it is able to effectively and prudently disperse the foreign aid it receives will likely determine its standing among rebel groups. The Syrian Opposition Coalition receives political and financial support from Western and Arab states alike. Its primary backers are the United States, Great Britain, France, Germany, Italy, Turkey, Egypt, Jordan, Saudi Arabia, Qatar, and the United Arab Emirates. The Supreme Joint Military Command, or SMC, was officially formed to act as the Defense Ministry of the Syrian Opposition Coalition, yet it functions on its own authority. Rebel commanders from across Syria—260 in all—participated in its foundation in December 2012. The SMC’s primary goal is to unite the various armed groups in the rebellion and gradually form a national army by establishing a formal chain of command, though in practice little effort has been made by the SMC to control ground units, as its commanding officer publicly admitted. The SMC would then develop a cohesive national strategy by coordinating regional militias, existing provincial-level military structures, and international supply chains. As part of this process, the SMC was designed to reduce the influence of extremist groups in Syria by serving as the principal channel for all international financial and materiel aid. The SMC comprises a council of leaders from various armed opposition groups and coalitions across Syria. The level of coordination between these armed groups and the SMC varies group-to-group. The council of leaders includes representatives from the Free Syrian Army, the Syrian Liberation Front, the Syrian Islamic Front, independent brigades, regional military councils, and defectors from the Syrian army. The council is made up of 30 elected members split evenly to represent the country’s five geographic fronts: eastern, western/middle, northern, southern, and the district of Homs. The council has no structural hierarchy, and command across the five fronts is not uniform. Instead, the SMC’s legitimacy is bottom-up, voluntarily given by the commanders that comprise it but with little coercive power by the SMC to control local commanders. SMC Chief of Staff Gen. Salim Idriss—a former general in the Syrian army and current commander of the Free Syrian Army—is viewed primarily as a political leader rather than the head of a top-down chain of command. Gen. Idriss was chosen to facilitate coordination between the SMC, the Syrian Opposition Coalition, and the Free Syrian Army due to his strong relationships with foreign officials and international suppliers of arms and equipment. The SMC receives direct military aid from a number of Western and Arab states and has vowed that it will only disperse this aid to approved rebel groups operating under the SMC structure. The SMC receives financial, materiel, and limited lethal support from Western and Arab states alike. Its primary backers are the United States, Great Britain, France, Germany, Italy, Turkey, Egypt, Jordan, Saudi Arabia, Qatar, and the United Arab Emirates. The Syrian armed rebellion, often discussed as a singular movement working in unity to overthrow President Assad, is more accurately described as an array of ideologically diverse and uncoordinated brigades and battalions with limited areas of operation. One high-ranking U.N. official recently estimated the number of armed militias operating in the Syrian rebellion at “more than a thousand.” These anti-Assad groups range from defectors of the Syrian army to civilians with no formal military training to fighters affiliated with terrorist organizations. Some brigades and armed groups have developed a degree of ideological and tactical cohesion by operating in larger coalitions such as the Free Syrian Army, the Syrian Liberation Front, or the Syrian Islamic Front. But even these coalitions are merely allied groupings of disparate brigades from across Syria and do not adhere to a uniform command structure. Despite the unifying goal of ousting President Assad, these alliances and their subunits have a range of tactics, constituencies, and visions of what a post-Assad Syria should look like. The Free Syrian Army, or FSA, is the largest group within the Syrian armed opposition. It is an umbrella group comprising small, ideologically moderate, and uncoordinated militias and battalions operating at local levels. The FSA’s leadership is fully incorporated into the SMC and is closely linked to the Syrian Opposition Coalition. The term FSA has often been used to describe the overall armed opposition to the Assad regime, but, in practice, the FSA is one of several alliances of rebel groups operating in Syria. The FSA is made up of small, localized battalions from all across Syria, organized loosely through provincial military councils. These battalions tend to fight in small geographic areas in defense of their hometowns and are less ideologically driven than others. 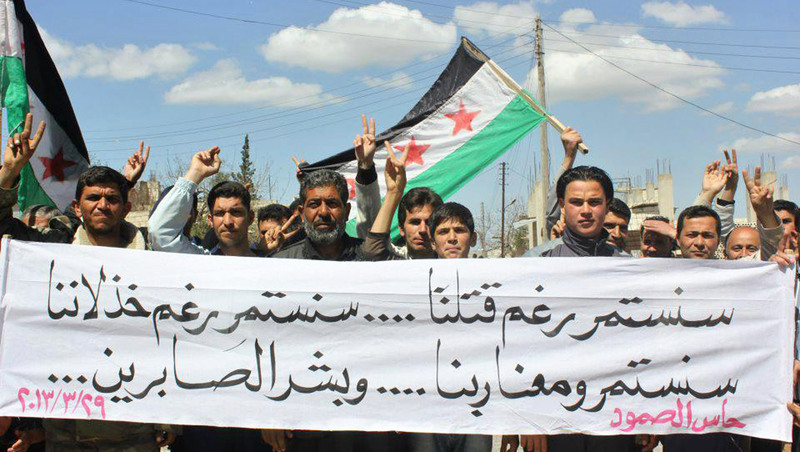 It is estimated that there are as many as 50,000 fighters who align themselves with the FSA. Commanders of FSA-affiliated brigades and battalions do not receive strategic or tactical orders from FSA and SMC leaders such as Gen. Idriss but instead operate unilaterally in the control of their forces. The FSA leadership’s primary responsibility is to facilitate coordination between battalions. Gen. Idriss is officially the commander of the FSA but serves as more of a political leader than as a field commander. The FSA receives financial, materiel, and limited lethal support from Western and Arab states through the SMC, as well as individual donors and informal funding streams. The Syrian Liberation Front, or SLF, also known as the Syrian Islamic Liberation Front or Jabhat al-Tahrir al-Souriya al-Islamiya, is an alliance of approximately 20 brigades and battalions across Syria. An estimated 37,000 fighters are affiliated with the SLF, making it the largest coalition of rebels independent of the Free Syrian Army. Each of the SLF’s subunits has its own name and operates independently; there is no inherent strategic or tactical unity in the coalition. The most powerful and well known of these brigades are the Suquor al-Sham brigades and the Farouq battalions. The SLF’s leadership has largely been incorporated into the Supreme Military Command, but the alliance remains more of a militant grouping than a political entity. SLF-affiliated groups are considered to be ideologically moderate Islamists, putting them at odds with some of the extremist groups operating in the country. While the SLF maintains brotherly relations with the FSA, it has criticized the FSA’s exiled leadership for being too detached from the realities of the in-country military conflict. The Saudi Arabian government has been the primary supporter of the SLF, but Saudi Arabia agreed in April to channel all future assistance through the SMC. The Syrian Islamic Front, or SIF, also known as Jabhat al-Islamiya al-Tahrir al-Souriya, is an alliance of approximately 11 brigades and battalions across Syria, most notably the Ahrar al-Sham brigades. An estimated 13,000 fighters are affiliated with the SIF. SIF-affiliates are viewed as conservative Salafists, who are more religiously motivated than the Free Syrian Army or the Syrian Liberation Front. Most SIF-affiliated groups, however, are considered to be Syrian nationalists that don’t share the most extreme ideological elements of Al Qaeda-affiliated groups such as support for a transnational Islamic caliphate. The Syrian Islamic Front’s subunits each have their own name and operate independently but are beginning to merge leadership and forces, making it a more hierarchical and structured rebel coalition than the SLF or the FSA. The Syrian Islamic Front’s leadership is not well incorporated into the SMC, but it has ties within the leadership council and its subunits have been cooperative with the SMC. The Syrian Islamic Front is largely financed by wealthy individuals from Saudi Arabia, Kuwait, and other Gulf states. The Nusra Front, also known as Jabhat al-Nusra, is an Al Qaeda-affiliated terrorist group, comprising approximately 6,000 foreign and domestic fighters. The Nusra Front has reportedly been receiving significant funding, arms, and training from Al-Qaeda and the Al Qaeda-affiliated group, Islamic State of Iraq. Some of Nusra’s fighters are foreign jihadists, many of whom are veterans of the Iraqi insurgency; it is unclear, however, what percentage of the Nusra Front’s supporters are foreign fighters as opposed to Syrian nationals. The Nusra Front is a well-armed group that has claimed responsibility for multiple suicide bombings and asymmetric attacks against Assad-regime targets. The Nusra Front is also considered to be a fiercely sectarian Sunni group in violent opposition to Syria’s Alawite community—an ethnoreligious group of Shiite Muslims who comprise 12 percent of the Syrian population and the majority of the Assad regime. The Nusra Front has a mixed relationship with other elements of the Syrian rebellion. Shared opposition to President Assad and the effectiveness of Nusra Front fighters have led to some cooperation between the Nusra Front and other rebel battalions, including the SLF’s Deir ez-Zour Revolutionary Council and the Syrian Islamic Front’s Ahrar al- Sham. Opposition to the Nusra Front’s extremist ideology and the influence of foreign fighters within the group, however, has led to direct confrontation between the Nusra Front and other rebel groups throughout Syria. Leaders of the FSA and the SLF have sought to publicly distance themselves from the Nusra Front following its open pledge of allegiance to Al-Qaeda leader Ayman al-Zawahiri. Kurds are an ethnic group representing 9 percent of Syria’s ethnically diverse population and are concentrated in the country’s north and northeast regions. Until recently, most Kurds had not taken sides in the rebellion, but the expansion of indiscriminate violence by the Assad regime against population centers and the prospect of greater autonomy for Kurdish regions in Syria have led to an increase in Kurdish support for the rebellion. While Kurdish militias still prioritize the independence and protection of their communities over a nationalist or revolutionary agenda, their role in the conflict may grow. As of late March, the Kurdish People’s Defense Units, often referred to as the YPG, has agreed to share control of a district in northern Aleppo with other rebel groups. Additionally, some Kurdish fighters have been incorporated into the SLF, the Tawhid Brigade, and the Suquor al-Kurd Brigade. There have been reports of clashes earlier this year between Nusra Front battalions and Kurdish groups in the north, leading to criticism of the Nusra Front by fellow rebel groups for wasting precious resources that could otherwise be used in the fight to remove President Assad. 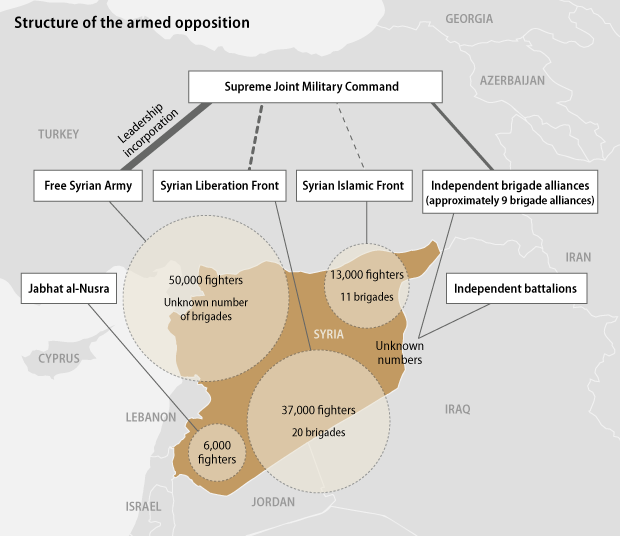 There are also roughly nine brigade alliances that operate independently of the Free Syrian Army, the Syrian Liberation Front, or the Syrian Islamic Front. Some of them have been incorporated into the SMC structure, while others, particularly fringe extremist groups, remain independent. The largest of these independent brigades is the Ahfad al-Rasul Brigade. Its leadership is incorporated into the SMC and it coordinates with the SLF. It is composed of an estimated 15,000 fighters and has been funded by the Qatari government. Other notable independent groups with leadership incorporated into the SMC are the Syrian Martyrs Brigade, the Fajr al-Islam Battalion, and the Al-Haqq Brigade. Support for Syrian opposition groups, particularly the armed portion of the rebellion, comes from a variety of sources, including national governments, wealthy individuals, and nongovernmental organizations. For the majority of the rebellion, financial and materiel support was delivered to Syrian opposition groups through ad hoc or informal channels, which created an uneven set of capabilities for armed groups and a disproportionate amount of influence by the most ideologically extreme groups. The expansion of the war, however, and the increasing, though limited, cohesion of the Syrian opposition has created a more formal process of support for the rebellion and has placed an emphasis on foreign-government aid. The core group of foreign-government supporters—including the United States, Turkey, Saudi Arabia, Qatar, and the United Arab Emirates—have pledged to direct all military aid and assistance through the SMC, allowing the coordinating body to direct funds as necessary to rebel alliances and brigades, a process the Center for American Progress has advocated for since August 2012. Still, it is unclear whether this international pledge to use the formal SMC process will have the intended effect of forming a more cohesive Syrian opposition and strengthening the more moderate elements of the rebellion. The formal assistance processes are in their nascent stages, which have led to the inefficient dispersal of aid and supplies to the areas in need. Furthermore, many rebel groups, even those who are closely linked to the Syrian Opposition Coalition and the SMC, still receive much of their funding from informal channels and ideologically motivated supporters. Finally, in order for the formal process of assistance to work, Western and Arab governments will need to adhere to their pledges and maximize the amount of support delivered through the SMC, thus giving it the financial leverage it needs to coerce greater unity from the different rebel groups in Syria. But several of the most important foreign-government funders of the opposition support specific factions within the rebellion, with Qatar, Turkey, Saudi Arabia, and the United Arab Emirates each backing different political and armed groups. Even the United States has supported rebel groups without going through the formal SMC process, as seen most clearly in U.S. training for Syrian rebel groups operating along the Jordanian border. The competition for limited resources within the Syrian Opposition Coalition and the SMC— exacerbated by informal funding streams and factionalism—poses the most immediate risk to the effort to create a cohesive, national Syrian opposition that could immediately step in and fill the ensuing security vacuum if and when the Assad regime falls. Though the Syrian Opposition Coalition and the Supreme Joint Military Command have made some progress turning the Syrian rebellion from a disorganized series of armed groups and political actors into a united opposition force, their efforts remain far short of what is needed to establish a single, coherent voice and strategy for a post-Assad Syria. The current limitations of opposition coordination complicate existing U.S. policy options and demand greater planning for several potential contingencies stemming from the lack of a cohesive national opposition. As the Center for American Progress has stated on multiple occasions, increased materiel support and lethal aid to the rebels should be contingent on better organization by the opposition in order to limit the potential for a proliferation of weapons. Without a stronger mechanism by the SMC to distribute supplies and arms, it is unlikely that directly arming the opposition will contribute significantly to the anti-Assad effort. But failing to provide the Syrian Opposition Coalition and the SMC with any financial and materiel support will eliminate what little leverage they currently possess over the transition efforts. Additionally, the internal divisions and lack of an effective national strategy by the Syrian opposition reduce the likelihood that the rebels will be able to contribute to several critical postconflict priorities. In particular, the prospects of securing Syria’s chemical-weapons stockpile, eliminating the space for terrorist groups to operate, safeguarding the country against collapse into sectarian violence, and leading the country through on effective and stable political transition are tenuous at best based on current levels of rebel organization. The United States and the international community will need to think carefully about how to address each potential contingency without being able to count on a unified Syrian opposition to shoulder the burden. The central question for U.S. policymakers now becomes whether enough progress has been made and enough potential remains to establish a truly unified Syrian opposition. If the answer is yes, then a redoubling of efforts must be made to bolster the international and domestic legitimacy of the Syrian Opposition Coalition and the SMC. This includes ensuring that all international supporters of the opposition adhere to their commitment to deliver all funding, supplies, and arms through these formal channels. If the answer is no, then policymakers should begin determining how best to pursue U.S. goals and priorities working through channels independent from the formal opposition. This may include independent action to secure or destroy chemical-weapons stockpiles, funding and training individual brigades for specific tasks such as maintaining a refugee camp on the border with Jordan, or reaching out to more moderate members of the current regime, who could help maintain order and security if and when President Assad is removed from power. Understanding the capabilities and limitations of the Syrian opposition is crucial to assessing the situation in Syria and what options exist. Before any decisions are made, U.S. policymakers should consider whether the opposition has the capability to effectively and peacefully step in and assume control in a post-Assad Syria. Without factoring in the structure and organization of the Syrian opposition, there are simply no options on the table for U.S. policymakers. Ken Sofer is a Research Associate with the National Security and International Policy team at the Center for American Progress. Juliana Shafroth is an Intern with the National Security team at the Center.